So, You’ve got a gig bag over your shoulder, a pedalboard in one hand, and an amp in the other…what’cha gonna bring? In an effort to design the ultimate small “swiss army knife” combo, the Ebo Customs “Bar Fly” is an 18 watt, 1x10” workhorse. It features two distinctly-voiced input sections; “HOT” is thick, throaty, and more aggressive, swinging from warm fat tweed to gnarly rock tones. “NOT” features a cleaner, more shimmery “Blackface” vibe with plenty of headroom and spank, and a beautifully subtle overdrive when pushed, as well as a footswitchable gain boost. The “Bar Fly” features the same control compliment as our larger “Del Rio” amp (”GAIN,” “TONE,” “TOP,” and “REV”), voiced specifically for this combo. while I did attempt to capture some of the Del Rio’s vibe & best features in the BAR FLY, it is not just a 1x10” version of that amp. it was designed to have a broader range of flavors to suit any style, session, or gig…again, a little “Swiss Army Knife” amp, with enough horsepower to hang where other small combos cannot. 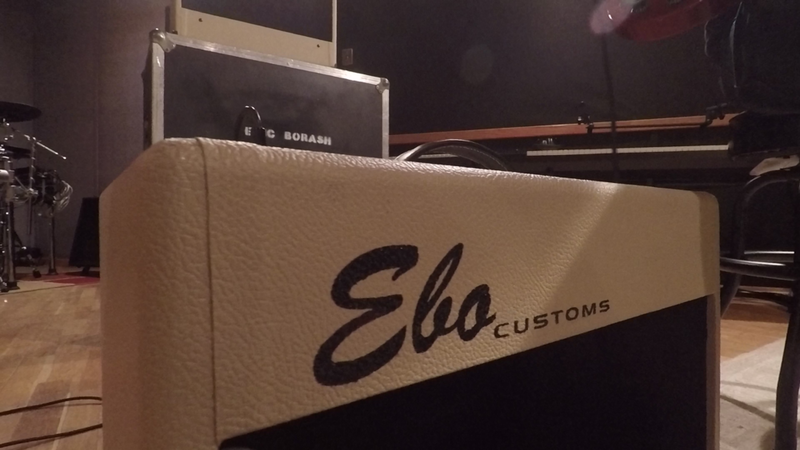 Of course, the BAR FLY also features Ebo Customs’ proprietary reverb circuit, configured as a “side-chain” channel, independent of the dry signal path. This allows for use as a dedicated “reverb amp.” The reverb really does some special things in this amp, and it is configured to compliment the dry signal without ever washing it out, even at extreme settings. I love all of the same small vintage combos y’all do…I own them, have used them for years. They all do some cool stuff. However, they all have their limitations. The BAR FLY checks all the boxes…more than loud enough to get over a drummer, plenty of clean headroom at any volume, tons of nasty-on-demand without sacrificing clarity or low-end punch (did I mention that it HAS low-end punch???). Most importantly, it does all this while retaining the warmth, grit, and soul of those little old combos.